Whenever I attend a particularly boring faculty meeting, my coping mechanism is to think about my students. I imagine feeling like they do…forced to sit down and listen, no matter whether you find the presentation meaningful, no matter whether there’s a million other things you would rather be doing. One of the primary points of conflict between a teacher and a class is the apathetic divide. We hear it all the time in the faculty lounge: They just don’t care. A teacher’s subject is (hopefully) a life passion. More often than not, teachers were good students in school. At the least, we went through the motions even when we didn’t care. We graduated from high school and college. Now that we’ve reached our academic goals and sit on the teaching throne, it’s easy to forget the predicament of the student. Aside from the rare elective, student attendance in your classroom is required. They have to be there whether they like it or not. They may rather be playing video games, talking to their friends, playing outside, reading Harry Potter, or doing literally anything else. For a teacher, the resistance to education is exasperating. Can’t they see how important this is to their future?! No. In some cases, they can’t and they don’t. Your mindset can make all the difference. First, I think it helps to be humble. Your subject will be embraced by some students, but it is not everyone’s saving grace. A human being will get by just fine in life not understanding the nuances of Shakespeare, or the correct annotation for chemical compounds. If you teach the fundamentals in the lower grades — maybe it will take another year for a student to turn it around. Does that mean you lower the expectations? No. Just don’t take for granted that your subject should matter to people. You have to sell it. Consider yourself an ambassador for your subject. Assume everyone thinks it’s boring and try to convince them it’s important and interesting. Think outside the box to design engaging, meaningful activities for your students. Don’t take anything personally. A student who sleeps in your class or forgets to do your homework is not personally insulting you. Sometimes they’re a math person in an English class. Sometimes they stayed up all night taking care of a young sibling. Sometimes they’re mad at friends and take it out on you. Students are complicated bundles of personal interests, family histories, social relationships, past experiences in school, etc. They bring this with them to your classroom. And you, dear teacher, are a representative of the establishment. You are an authority figure. Only after getting past that identity do you become a facilitator of whatever subject you teach. When we feel personally insulted, we naturally respond with anger and spite. Ultimately it can cause teachers to feel bitter, get burnt out, and leave the profession. 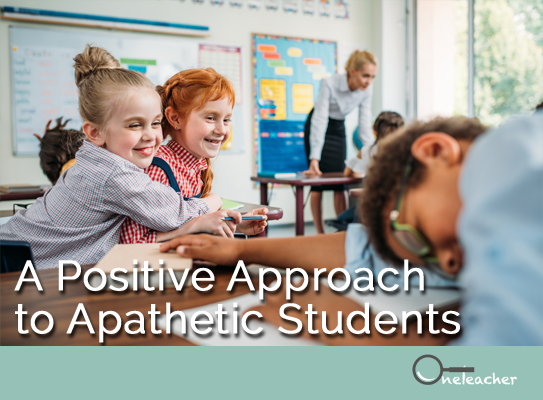 Depersonalizing student behaviors, paradoxically, can help you empathize and connect with them in order to increase your impact as a teacher. Talk with them outside of class. Ask them how their weekend went. Do this regardless of how they behave in your class. This isn’t a magic formula for curing student apathy. There is no magic formula. Navigating the baggage students bring to the classroom, facilitating a connection to the subject matter — this is the art of teaching. Your style depends on your personality and the dynamics of your school. It’s an ongoing process for all teachers. Navigating the baggage means being aware of the obstacles to learning, and being sensitive to them. I think we can teach more effectively and benefit emotionally by taking a deep breath and trying to see the world from the student’s perspective. Try it at your next faculty meeting. If you’re a looking to make an impact by working in a Title 1 school, then contact the matchmakers at OneTeacher to learn about their amazing teacher placement program today! Billy Robb is a high school social studies teacher working at a charter school in South Phoenix. Read more of his work by visiting www.billyrobb.com. Billy Robb is a guest blogger for OneTeacher whose views and publications on other platforms are his own and are not endorsed by or affiliated with OneTeacher.